“Hamas stays on list during Council’s appeal to December judgement,” Susanne Kiefer, a spokeswoman for the European Council said on Twitter. Hamas’ military wing was added to the EU’s first-ever terrorism blacklist drawn up in December 2001 in the wake of the 9/11 attacks on the United States. 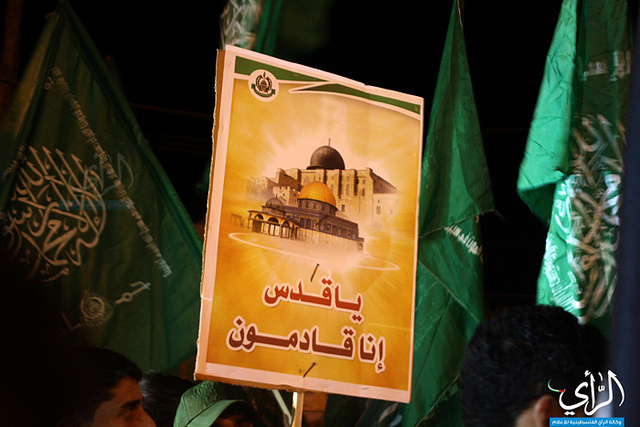 The EU then blacklisted the political wing of Hamas in 2003. But the General Court of the European Union ruled last year that the Hamas blacklisting was based not on sound legal judgments, but on conclusions derived from the media and the Internet.The appeal process is expected to take around a year and a half. Hamas denounced the EU decision. “This decision completely contradicts the court’s ruling,” Hamas spokesman Fawzi Barhum told AFP. “It is unjust and wrong to our people and legitimate resistance, and also encourages the occupation to continue its crimes,” he said of Israel. “We reject this decision and call for its review, and to remove all forms of injustice against our people and Hamas,” Barhum said. Two other groups have however been withdrawn since the last EU list was published in July 2014: the Holy Land Foundation for Relief and Development, which US officials have accused of funnelling money to Hamas, and Al-Takfir and Al-Hijra, an Egyptian Islamist group. An EU official said the relevant member states that originally put the groups on the list had “changed their minds,” adding that Italy had requested the listing of the Holy Land Foundation and Britain had sought the inclusion of Al-Takfir and Al-Hijra. The row over the listing of Hamas, which has been in power in the Palestinian territory of Gaza since 2007, has threatened to undermine recent moves by Brussels to play a bigger role in reviving the moribund Middle East peace process. Hamas has said the EU’s appeal against the judgement by the General Court of the European Union is “immoral”. Hamas’ funds in Europe have remained frozen since the December decision. Israel meanwhile hit out at the original decision to remove Hamas. The EU list still includes organisations such as Lebanon’s Hezbollah militia, Kurdish rebel group Kurdistan Workers Party (PKK), Colombia’s FARC and Peru’s Shining Path. EURACTIV Greece: ????????? ???????????? ???????? ? ????? ??? ??? ? ?, ???? ?? ????????? ?????? ?